By Keith Cowing on August 30, 2018 5:32 PM. 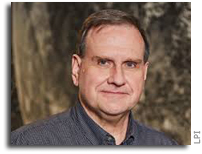 Keith's note: FYI you may notice that emails from folks at JPL will soon have different addresses: jpl.nasa.gov will be changing to jpl.caltech.edu. Apparently NASA finally realized that people employed by JPL, a FFRDC, actually work for Caltech - not NASA. Is The Space Foundation NASA's New Party Planner? By Keith Cowing on August 29, 2018 10:04 PM. By Keith Cowing on August 27, 2018 2:28 PM. Keith's note: In addition to all of the unfinished work from ISS that will somehow be accomplished on the Lunar Gateway NASA also wants to handle samples returned from Mars. Back in the 80s when NASA toyed with this idea they decided that an entire mini-space station was needed. Oddly it was on the same scale as the Gateway. To be certain, technology has advanced since then but the notion that NASA can shove activities with requiring high levels of biocontainment into a small, cramped mini-space station strains the limits of credibility. By Keith Cowing on August 25, 2018 9:43 PM. By Keith Cowing on August 25, 2018 7:35 PM. "With this in mind, the Trump Administration wisely requested $150 million for this coming year to enable and mature commercial capabilities in low earth orbit (LEO). The Trump Administration was also smart enough not to dictate in any specific detail how this money will be spent. They are welcoming ideas from industry, and it will be the job of new NASA Administrator Jim Bridenstine to make the final decision in the coming months." 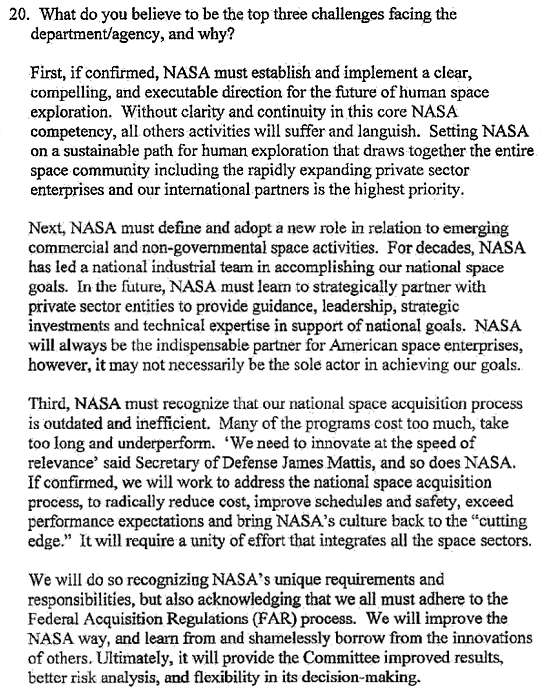 Keith's note: Wait a minute: while he lauds the potential for possible commercial uses of ISS as a reason to keep it operational NASA Trump appointee Jeff Waksman (who was fired earlier this year) forgot to mention that it is the Trump Administration that wants NASA stop funding ISS after 2024. So they are creating the problem that he seems to be trying to solve. He also omits mention of the fact that the White House wants the entire cost of ISS to be paid for by commercial entities after 2024 but does not explain where that money will come from. Yet he talks about using SLS to launch new ISS components. I am not sure anyone at NASA is talking about $1 billion SLS launch fees to put new modules on the ISS. I think Waksman is trying to say that the ISS has a lot of potential. He's quite right. I'm just not sure he knows how to tap that potential. By Keith Cowing on August 23, 2018 5:38 PM. "And finally, to those of you who will guide this mission, on a personal level, I just -- I want to assure you that millions of Americans will carry you in their prayers. And they have faith and hope you have confidence that, as you go, you do not go alone. That millions of Americans will claim that ancient promise that if you "rise on the wings of the dawn", if you "go up to the heavens," "even there His hand will guide you," and "His right hand will hold us fast." Our heroes will go with the prayers of the American people." By Keith Cowing on August 23, 2018 10:13 AM. "Vice President Mike Pence is coming to Texas later this month to help raise money for U.S. Rep. John Culberson, R-Houston, amid a tough re-election fight. Pence will headline a fundraiser for Culberson on Aug. 23 in the Houston area, according to an invitation obtained by The Texas Tribune. The invitation for the breakfast event bills Pence as a "very special guest." Next week, I will visit @NASA_Johnson Space Center in Houston to talk about the future of human space exploration. Under @POTUS Trump's administration, America is leading in space once again! "Vice President Mike Pence, with NASA Administrator Jim Bridenstine, will visit NASA's Johnson Space Center in Houston Thursday, Aug. 23, to discuss the future of human space exploration and the agency's plans to return to the Moon as a forerunner to future human missions to Mars." Keith's note: So ... did VP Pence decide to visit Texas to do the Culberson fundraiser - and then added the JSC visit - or vice versa? When was the Bridnestine visit to JSC added? This is his second visit to JSC for both Pence and Bridenstine whereas other NASA field centers have not yet been visited once. By Keith Cowing on August 21, 2018 11:40 AM. "The Senate has emerged as a major impediment to President Trump's hopes for a new "Space Force." While the House GOP has been largely supportive of the idea of creating a new military branch for space, skeptics in the Senate from both parties have raised concerns about its cost - and the potential for adding to bureaucratic overhead at the Pentagon. There's a recognition that players like China are increasingly turning to space, leaving a risk that the U.S. could be left behind. But there are also fears that it will turn into an expensive boondoggle." By Keith Cowing on August 20, 2018 10:19 PM. 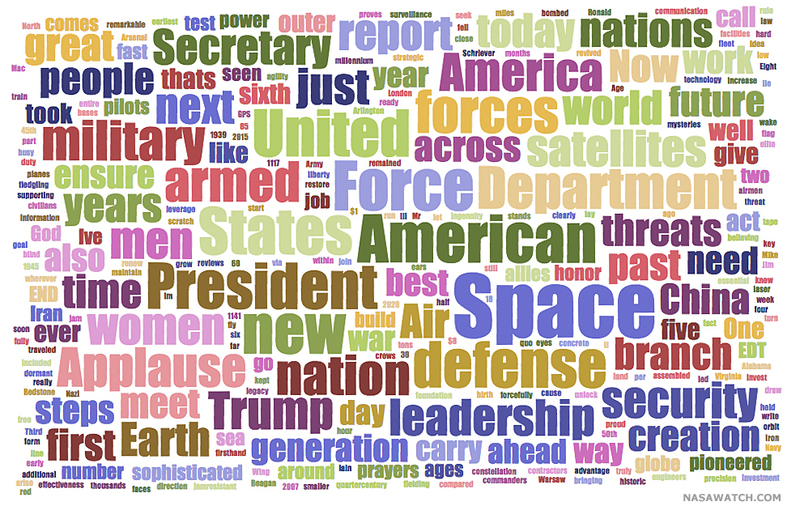 Keith's note: Last week it was Space Force merchandise from the Trump 2020 campaign. Now, it looks like the NRCC (National Republican Congressional Committee) has jumped on the whole space thing. The fact that we no longer fly this particular space vehicle seems to be of minor importance. But hey, we now get to say SPACE FORCE all the time. Is A Space Force Needed? By Keith Cowing on August 18, 2018 7:18 PM. "A security director is backing President Trump's idea of creating a Space Force, citing a troubling development of counterspace technologies by some of the United States' biggest rivals. Todd Harrison, director of the Aerospace Security Project at the Center for Strategic and International Studies, says that while the U.S. still has a "great advantage" over countries like China and Russia, the U.S. military is not doing enough to protect itself. "Where other countries are causing concern for us is not that they're developing space capabilities, but they're developing counterspace capabilities," Harrison told Hill.TV during an interview that aired on Friday, referring to weapons and other destructive systems designed for offensive uses." "For now, it is unclear whether a big, new military reorganization would add anything useful to what the administration is already doing -- setting up a joint space command, putting more emphasis on developing new space military technologies and pushing harder for the cultivation and promotion of space-oriented officers and specialists. The administration should step up these efforts, not inaugurate a massive bureaucratic overhaul that could for years prove a diversion and distraction." By Keith Cowing on August 16, 2018 3:40 PM. By Keith Cowing on August 16, 2018 1:42 PM. "A NASA camera aboard the Deep Space Climate Observatory (DSCOVR) satellite captured a unique view of the moon as it moved in front of the sunlit side of Earth last month. The series of test images shows the fully illuminated "dark side" of the moon that is never visible from Earth." Keith's note: Ok, putting aside the inaccurate nomenclature for a moment, NASA, if the "dark side" is "fully illuminated" then its not the "dark side", right? By Keith Cowing on August 16, 2018 10:30 AM. "NASA Administrator Jim Bridenstine said Wednesday that he supports "100 percent" the agency's Space Launch System program and the future of Alabama's Marshall Space Flight Center. Bridenstine spoke to reporters in historic Marshall Building 4619 while taking his first tour of NASA's propulsion center in Huntsville since the Senate confirmed him as administrator in late April." "But if we can take advantage of commercial industry that can develop a reusable rocket, we want them to be successful," he said after Geyer was done speaking. "We want to partner with companies that are willing to step up and take that challenge. It is not an 'either/or.' Right now, our best, closest capability is going to be SLS and Orion, but if 10 years from now, 20 years from now, there's a commercial capability that's successful, we're going to use it. And we want them to be successful. 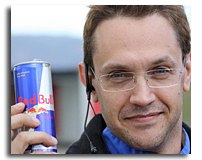 In fact, we're partnering with those companies today on commercial crew and other things." Keith's note: When you are playing a home game you praise the home team. Curiously, when Bridenstine is not attending a home game he is much more willing to talk about other ways to send things into space than SLS - as was the case recently at JSC. According to sources present, Bridenstine all but cut off JSC director Mark Geyer as he gushed about SLS. Instead Bridenstine, as quoted in the article above, made a point of suggesting that SLS is not the only answer. What is really interesting is his comment "... if 10 years from now, 20 years from now". Take a look at NASA's various notional cartoons about how it wants to do the Moon/Mars thing. Their plans stretch into the 2030s. That certainly falls in the 10-20 year future time frame. So ... that would seem to imply that Bridenstine is willing to consider alternatives to using SLS for Moon/Mars. Up until now to suggest such a thing would have been heresy. Now, it depends on what Zip Code the press briefing is being held in. Bridenstine may be 100% supportive of SLS - but exactly what that means is open to speculation. One thing is for certain: he may sip the SLS Koolaid but he's not drinking it. By Keith Cowing on August 16, 2018 9:54 AM. 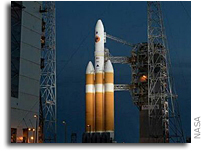 "Another example involved the military-news outlet Defense One, which was left out of a media roundtable with the deputy secretary of defense earlier this month to help roll out President Donald Trump's proposed Space Force. The slight came after a Defense One reporter got an early scoop on plans to set up the new branch, breaking the story before the Pentagon was ready for it to go public. Kevin Baron, the executive editor of the site, confirmed that none of his reporters were invited to the briefing and said that [Pentagon chief spokeswoman Dana] White had conceded to him in an email that the snub was due to the initial story." By Keith Cowing on August 15, 2018 9:15 PM. "Boeing collects personal information from and about individuals for a variety of purposes. 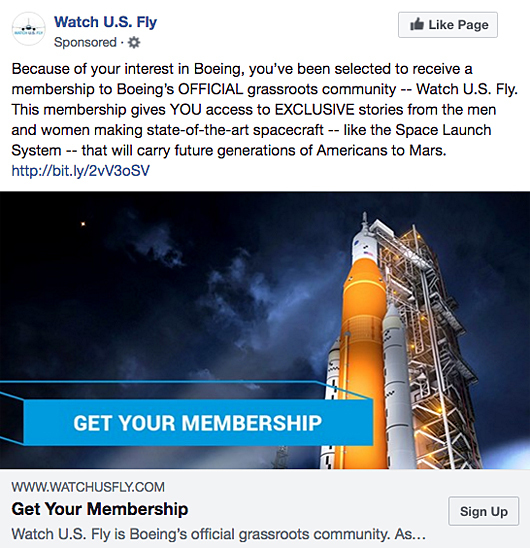 In some cases Boeing requests personal information from you, or from your employer in the case of organizational Services. In other cases we obtain personal information by noting how you and the devices you use interact with our Services. Examples of personal information include: first and last names, phone numbers, e-mail addresses, mailing addresses, passport or government identification information, gender, date of birth, country of residence ... We acquire data from credible third-party sources that are either publicly or commercially available. This information includes personal data such as your name, address, email address, preferences, interests, and certain demographic data. For example, personal data is collected when you access our applications through social media account logins. We combine personal information collected through our Services with other information that we or third parties collect about you in other contexts, such as our communications with you via email or phone, or your customer service records. We treat such combined information as personal information and protect it in accordance with this Statement." And if you are older than 14 Boeing will happily collect this information from anyone. Why does Boeing want to know this about you? We've discussed this creepy activity in previous posts. By Keith Cowing on August 14, 2018 6:23 PM. "National Aeronautic Space Administration (NASA or Deep Space Exploration Administration or DESA) - Aside from the fact this is based very heavily in science, there is also a large cry to reduce their $105.5b budget and even movements to roll our space program into DSEA. With the help of, and to the credit of, the administration there can be drastic cost cuttings for big wins for the administration. ... Aside from understanding the technical aspect of NASA and the components that goes into it. I can also understand the economics of launching satellites and supplies into space for both private and government entities. We all know that Richard Branson with Virgin Galactic, Elon Musk with Space-X and various investors including Shaun Coleman with Vector Space are racing for more contacts with NASA and others. This is a time when NASA can scale back without huge loss to their operation and we can continue to provide suitable funding for suitable research that benefits the citizens both scientifically and economically. It is not outrageous to believe that a small cut in the $105.5b budget cannot be cut by even a small percentage for a large gain to the taxpayers while providing a big win for the administration." One would hope that Dimock now has his budget facts straight and that he knows the actual name of the agency where he works - now that his job is to communicate all of that technology stuff to the public. Oh yes: Although Dimock is not formally a White House Liaison for NASA and is buried multiple levels down in the org charts he regularly does the liaison thing with the White House - directly - just not through the normal channels. By Keith Cowing on August 14, 2018 8:41 AM. "Richard Danne -- the designer of a NASA logo from 1975 -- went off on Trump's Space Force artwork. Danne ripped into the designs released by the Trump Administration ... telling TMZ, "This logo effort is typical of the present administration: impulsive, ill-advised, superficial, and second-rate." "A random student from the Los Angeles Art Center could put these logos to shame ... They are, in a word: sophomoric!" Richard is peeved some of the Space Force designs were lifts from past NASA logos. "The images are totally derivative from NASA graphics but are -- All flash and no substance, and comical really." By Keith Cowing on August 12, 2018 2:45 PM. - Establish a new U.S. Space Command to improve and evolve space warfighting, including integrating innovative force designs, concepts of operation, doctrines, tactics, techniques and procedures." By Keith Cowing on August 10, 2018 2:16 PM. "A suspicious package that fell from the sky over New Jersey caused some alarm because it contained a note that mentioned President Donald Trump. South Brunswick police say the package, attached to a parachute, was making a hissing sound and included a note that said: "NASA Atmospheric Research Instrument NOT A BOMB!" If this lands near the President, we at NASA wish him a great round of golf." By Keith Cowing on August 9, 2018 4:17 PM. 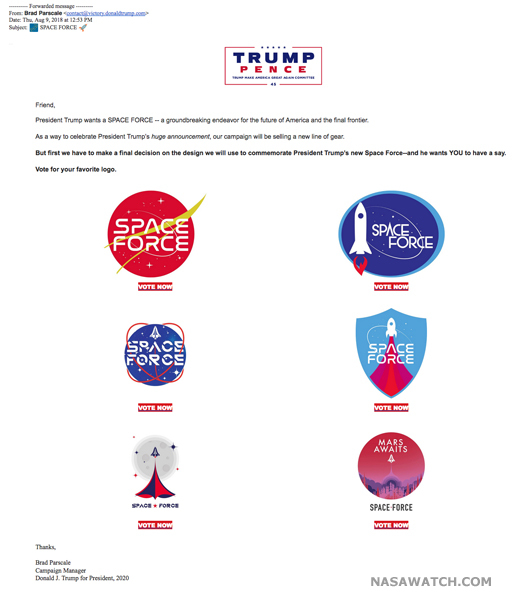 According to this official Trump 2020 campaign email from Brad Pascale: "Friend, President Trump wants a SPACE FORCE -- a groundbreaking endeavor for the future of America and the final frontier. As a way to celebrate President Trump's huge announcement, our campaign will be selling a new line of gear. 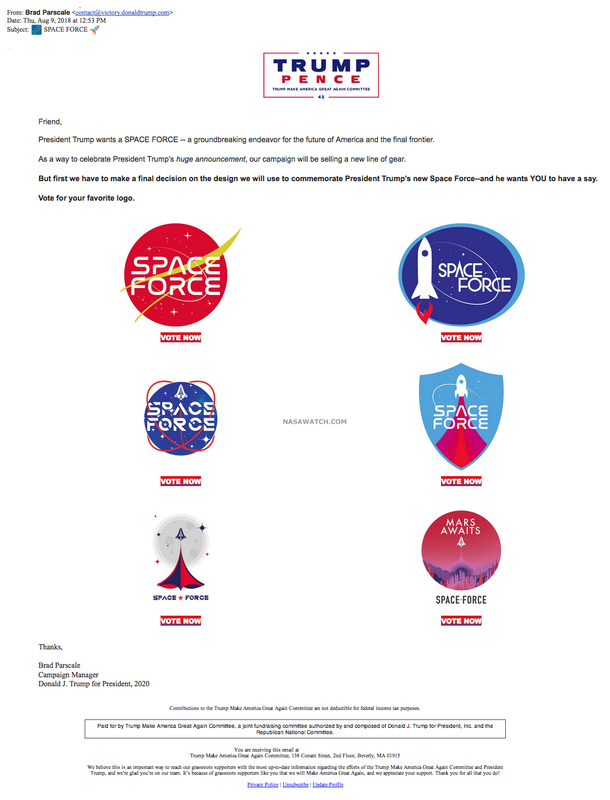 But first we have to make a final decision on the design we will use to commemorate President Trump's new Space Force--and he wants YOU to have a say. Vote for your favorite logo." By Keith Cowing on August 9, 2018 3:17 PM. "And while these steps have been vital to our national defense, they're really only a beginning. They're only a beginning of meeting the rising security threats our nation faces in space today and in the future. As President Trump has said, in his words, "It is not enough to merely have an American presence in space; we must have American dominance in space." And so we will. (Applause.)" By Keith Cowing on August 9, 2018 11:47 AM. Keith's note: According to the White House Vice President Pence will visit the Department of Defense on Thursday and will be joined by Secretary of Defense Mattis at an honor guard ceremony and a DOD briefing. Following that briefing the Vice President will give formal remarks. 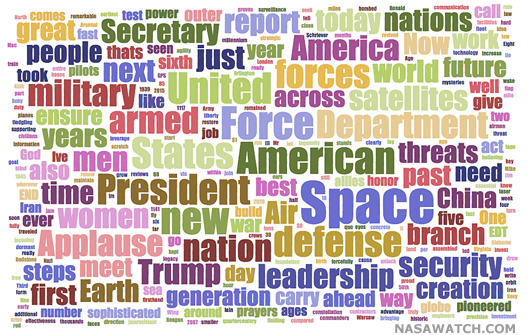 Among the topics to be covered with be President Trump's proposed Space Force. "I'm hereby directing the Department of Defense and Pentagon to immediately begin the process necessary to establish a space force as the sixth branch of the armed forces. - President Donald J. Trump"
Using NASA's Logo: Expensive T-Shirts Or Global Soft Power? By Keith Cowing on August 8, 2018 10:47 AM. 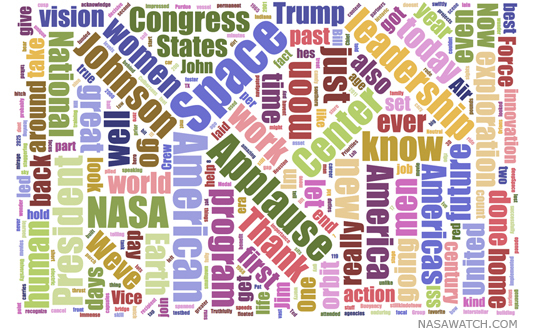 Keith's note: I'm the last person to say that NASA should not explore new ways to put its branding in front of people so as to further explain the agency's mission and accomplishments. Indeed I harp on NASA relentlessly to seek out new ways to get its brand out. People like to identify themselves with what NASA is and what it does. In so doing, NASA itself gets more visibility. And NASA just turned 60 so its doing a victory lap right now. 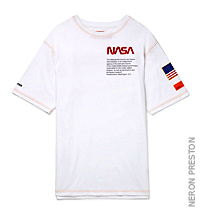 This recent article "NASA Releases Streetwear Fashion Line To Celebrate Its 60th Anniversary" talks about the new clothing line by Heron Preston that features NASA's retired "worm" logo: "If you would have asked me to figure out how NASA would celebrate their organization's 60th anniversary, I probably wouldn't have guessed a new streetwear fashion line. Yet, that's exactly what the National Aeronautics and Space Administration opted to do. .... If you're hoping to get your hands on some of the NASA gear, you better have some deep pockets, as t-shirts are currently priced at $326, while some of the more popular items like the iconic backpack ring up at a hefty $1,342. The most expensive item in the collection, the parka pictured above, will set you back nearly $2,000." Great stuff. The items being sold by this designer perfectly match the logo usage that the agency's original stylistic guidelines specify and they look a lot like the stuff I used to buy in NASA gift shops when I worked at the agency in the 80s and 90s. And of course, as many of you know, I am a NASA worm logo fan. But I paid $20 for those t-shirts - not $326. Hmm. 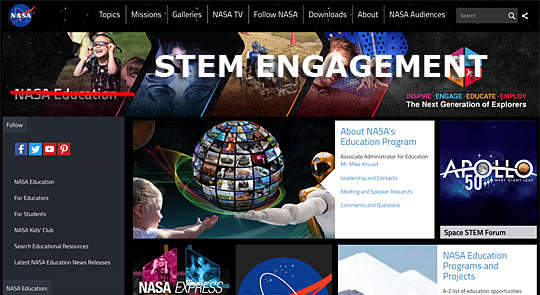 Continue reading Using NASA's Logo: Expensive T-Shirts Or Global Soft Power?. By Keith Cowing on August 7, 2018 4:42 PM. 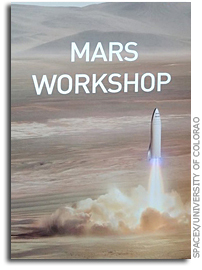 Keith's update: There is a meeting about Mars exploration underway at the University of Colorado in Boulder sponsored by SpaceX. Contrary to some initial descriptions the meeting is not "secret". But its not exactly "open" either. Rather, it is invitation-only. The purpose of the meeting according to sources is for SpaceX to ping Mars exploration experts outside their company about the technology needed to implement the Mars exploration plans that have been described by Elon Musk. It is likely that SpaceX will do more of these external events in the future. While NASA has yet to confirm that any of the 50-60 attendees are from the agency, sources report that the following institutions are represented: Colorado School of Mines, University of Colorado, Boulder; NASA HQ, ASI, JPL/Caltech; SpaceX, Lunar and Planetary Laboratory, University of Arizona; ASURE, MIT, Bechtel Corporation; Schlumberger; University of Florida; Freestyle Analytical & Quantitative Services, LLC; Ball Aerospace; Arizona State University; Brown University; NASA Ames; NASA Marshall, NASA KSC, EchoStar; NASA Glenn; JAXA; SpaceX/Tesla; BAERI; ESA; University of Central Florida; University of Western Ontario; Caterpillar Inc; NASA JSC; Aerospace Corporation; Maxar Technologies; MBRSC - UAE; Planetary Science Institute; LASP / University of Colorado, Boulder; and Honeybee Robotics. The big question is whether NASA is considering participating in the SpaceX Mars plans - plans which would send humans to Mars a decade or more before NASA does. While NASA human spaceflight people at HEOMD were invited to this event none of them apparently attended. Only Mars science types showed up. That's rather odd for a meeting where the prime focus is humans to Mars in giant rockets and building permanent human bases. Keith's further update: I spoke with NASA Science Mission Directorate AA Thomas Zurbuchen about this meeting. He said that that some of his program staff were invited to give presentations of what NASA was doing (and planning to do) on Mars but that they really had no input into the meeting structure itself. One of the topics that interests Zurbuchen is how SpaceX might be able to work collaboratively with NASA on sample return. Zurbuchen says that he has encouraged discussions about commercial, public/private partnerships on this and other topics sich as smallsats. But as for participation in human exploration, Zurbuchen said that no policy positions should be implied by NASA SMD's participation in this meeting about SpaceX's human Mars plans and that to the best of his knowledge no one at NASA has really been authorized to have such a policy discussion. By Keith Cowing on August 7, 2018 2:06 PM. "This appears to be the first meeting of such magnitude, however, with nearly 60 key scientists and engineers from industry, academia, and government attending the workshop, including a handful of leaders from NASA's Mars exploration program. The invitation for the inaugural Mars meeting encourages participants to contribute to "active discussions regarding what will be needed to make such missions happen." Attendees are being asked to not publicize the workshop or their attendance." Keith's note: Looks like NASA may be having some second doubts about its own #JourneyToMars thing - or what is left of it - and are seeking out alternatives. Smart. Of course no one is talking about this at SpaceX, NASA, or CU. Kudos to Eric Berger. Keith's update: I am still waiting for NASA HQ to admit that it's people are at this meeting even though I know that they are. As for the admonition to attendees not to talk about the meeting or their attendance, well, there's always Twitter. 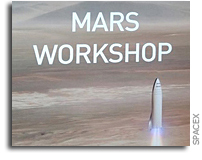 Still waiting for @NASA to confirm that it actually has staff at the secret @SpaceX Mars meeting at University of Colorado - and what they are talking about. By Keith Cowing on August 7, 2018 1:41 PM. "Despite significant cuts to NASA's Planetary Science Division budget early in this decade, the space agency has made impressive progress in meeting goals outlined in the 2013-2022 planetary decadal survey by the National Academies of Sciences, Engineering, and Medicine, says a new midterm assessment from the National Academies. 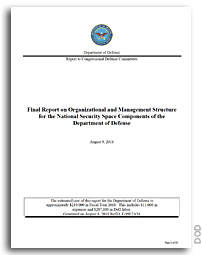 The report notes that the agency met or exceeded the decadal survey's recommendations for funding research and analysis, and for technology programs. However, NASA has not achieved the recommended timeline for New Frontiers and Discovery missions for the decade. At least one more New Frontiers mission and three Discovery missions should be selected before the end of the decade in order to achieve the schedule recommended in Vision and Voyages. The decadal survey, "Vision and Voyages for Planetary Science in the Decade 2013-2022", recommended a suite of planetary science flagship missions that could provide a steady stream of important new discoveries about the solar system as well as prospective mid-size missions and science, research, and technology priorities. It also included a set of decision rules on how to deal with funding shortfalls as well as possible increases. The new report assesses progress made by NASA so far and offers recommendations for preparing for the next decadal survey." By Keith Cowing on August 3, 2018 9:15 PM. Keith's note: It is rather obvious from prior comments - and especially this tweet from today - that President Trump equates NASA activities and those associated with his whole Space Force thing. Given 60 years of civilian focus, this could represent a significant change for NASA. Let's see how NASA, OSTP, DoD, and the National Space Council try to parse, spin, unpack, and otherwise explain this tweet. Maybe someone will finally explain what Space Force is and what NASA's role is with it. NASA Adminstrator Bridenstine retweeted this tweet and has spent more time talking about Space Force than anyone else. Perhaps he knows what is really going on. By Keith Cowing on August 3, 2018 12:17 PM. "Today, our country's dreams of greater achievements in space are within our grasp," said NASA Administrator Jim Bridenstine. "This accomplished group of American astronauts, flying on new spacecraft developed by our commercial partners Boeing and SpaceX, will launch a new era of human spaceflight. Today's announcement advances our great American vision and strengthens the nation's leadership in space." The agency assigned nine astronauts to crew the first test flight and mission of both Boeing's CST-100 Starliner and SpaceX's Crew Dragon. NASA has worked closely with the companies throughout design, development and testing to ensure the systems meet NASA's safety and performance requirements."